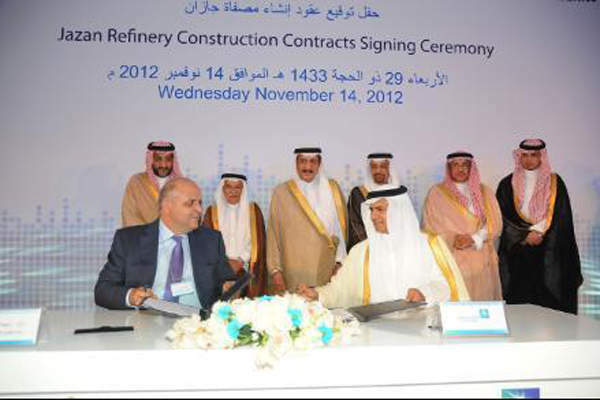 Major contracts for the Jazan Refinery and Terminal Project were awarded in November 2012. Image courtesy of Saudi Aramco. The power plant components for the project will be supplied by Siemens. 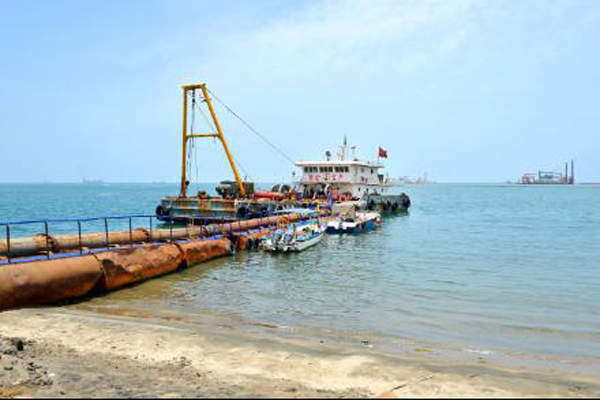 The integrated marine terminal will accommodate VLCCs. Image courtesy of Saudi Aramco. Jazan Refinery will boost employment in the area by generating more than 1,000 direct jobs and 4,000 indirect jobs. Image courtesy of NormanEinstein. 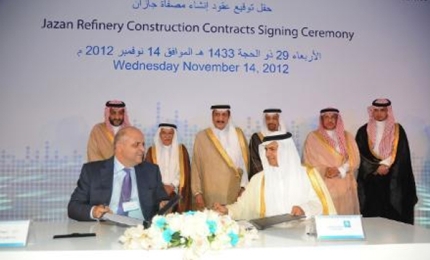 Saudi Aramco’s Jazan Refinery and Terminal is being constructed in the coastal part of the City of Bish. The construction works commenced following the selection of the major contractors in November 2012. The refinery is scheduled to start operations by the end of 2016. The project, which also integrates the construction of a supporting marine terminal and a power plant, is expected to generate approximately 1,000 direct jobs and 4,000 indirect jobs. Refined products from the refinery will be primarily supplied to the south-western region of Saudi Arabia and the surplus volumes will be exported. The project is being developed as a major component of the Jazan Economic City Project. The refinery will cover an area of 12km² and will process 400,000bpd of Arabian Heavy and Arabian Medium crudes to produce 80 million barrels per day of gasoline, 250 million barrels per day of diesel and more than one million tonnes per annum of benzene and paraxylene petrochemical products. Cool Planet Energy Systems started the construction of the first of three small-scale biomass-to-gasoline refineries in Louisiana in February 2014. A multiple-pier marine terminal will support the supply of crude oil from the Saudi Arabian oil fields to the refinery and also enable the export of surplus volumes from the refinery to global markets. The terminal will be designed to accommodate very large crude carriers (VLCCs). The 4,000MW combined cycle power plant, the largest of its kind in the world, will use approximately 90,000bpd of vacuum residue from the refinery and further provide electricity, hydrogen and water for the refinery, and convey the excess power to the national grid. A hydrocracker unit will comprise two parallel trains with a combined capacity of 54,500bpd. The diesel hydrotreater plant will comprise two trains with a capacity of 87,500bpd each. The project will further involve the construction and installation of a number of utilities, including storm water drains, oily water drains, sanitary sewers, conveying systems for cooling water, fire water and drinking water, instrumentation and control equipment, and communications equipment. A number of buildings will also be constructed, including the central control building, process information relay building and substation facilities. 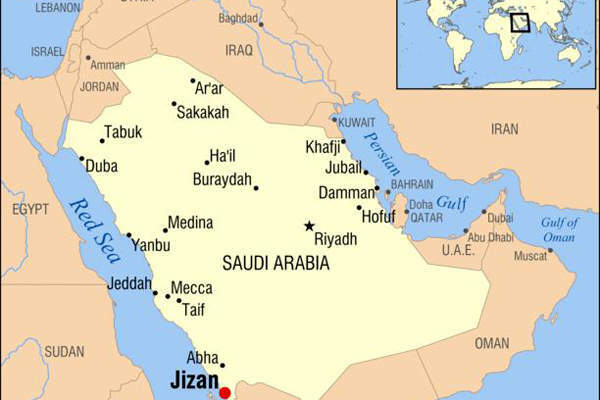 Jazan Refinery will implement technologies licensed to Saudi Aramco by Axens, including the naphta hydrotreating process for feedstock purification, aromising continuous catalyst regeneration (CCR) reforming process for producing aromatics, C5/C6 isomerisation process for the production of gasoline, ParamaX process for paraxylene and benzene production, and Prime-D gas oil desulfurisation hydrotreater for the production of ultra low-sulfur diesel (ULSD). Chevron’s ISOCRACKING technology has also been licensed for the project. The contracts for front-end engineering and design (FEED), as well as project management services (PMS), for the refinery and marine terminal were awarded to KBR in February 2011. The company was further awarded the FEED contract for the integrated power plant in November 2012. A $900m contract for the hydrocracker and diesel hydrotreater facilities was awarded to Técnicas Reunidas (TR). The engineering, procurement and construction (EPC) contract for the benzene and paraxylene facilities was awarded to JGC Corporation. "The project is being developed as a major component of the Jazan Economic City Project." Siemens was awarded the $966.8m contract for the supply of the power plant components. The contractual scope includes the supply of ten SGT6-5000F type gas turbines for synthesis gas (syngas) and diesel fuel, five steam turbines, 15 generators and ten heat recovery steam generators. The EPC contract for the tank farms within the northern and southern areas of the refinery was awarded to Petrofac, while the EPC contract for the utility facilities and buildings was awarded to Hitachi Plant Technologies. Other major contractors for the project include Al-‘Ali Al-Ajmi Group, Hanwa Engineering & Construction, and SK Engineering & Construction. Orion has been awarded the contract by Hanwha Engineering & Construction to supply its class 150 and 300 through conduit gate valves for the project. Elecotherm Consulting Engineering is the adviser for the thermal insulation and coating activities for the project. The larger Jazan Economic City Project, covering 108km², involves the construction of power plants, desalination plants, a seaport and a residential district. It will also house manufacturing facilities for a number of industries, including electronics, pharmaceuticals, processed foods and other sectors. Maharat Training Center at Al-Haqu was specially launched to train more than 500 young Saudis for the project. Another centre at Al-Darb is expected to be launched, which will increase the number of trainees for the project to 5,000. More than 70,000 people are expected to be involved during the peak construction phase of the project.